Whether you're slicing meat, dicing vegetables, or carving the Sunday Roast, a sharp blade makes cutting effortless. 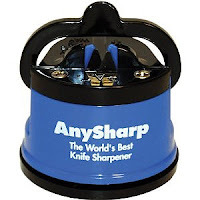 AnySharp restores a super sharp cutting edge to blunt knife blades that have dulled with use. Works with all your knives - even serrated blades. The unique, patented AnySharp uses tungsten carbide technology to extend the life of almost any knife. AnySharp works on virtually any knife, including expensive hardened steel knives and even serrated blades (like bread knives and hunting knives), making it unlike any knife sharpener, steel or sharpening stone you've ever used. The AnySharp's unique safety feature is its PowerGrip suction cup base, which attaches securely to any smooth surface or worktop without the need for any tools. In fact, it will attach to any smooth surface anywhere. You can even use it on a vertical surface like a tiled wall! 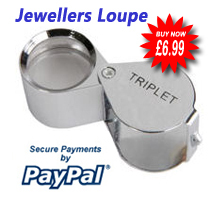 Once it's attached you can sharpen any knife safely single handed - keeping your free hand out of harm's way! When your whole knife has been run through, your knife edge may touch as it exits the sharpening tools. The AnySharp has a long-lasting polymer guiding top that is softer than metal, and therefore won't damage the metal edge, making it safe for your knives too. I believe this device has its place; when a knife gets so blunt that you can no longer sharpen it with a steel, you can use this gadget to bring the edge back and then hone it with a steel. Otherwise you will end up with a sharp edge that doesn't last very long. One minor problem I found with it is that it sometimes tended to make my knives one-sided (sharper on one side than the other), this is not an issue as you can correct it with a steel. So yes, I would recommend you get this device, but not instead of a sharpening steel, I believe you need both to achieve a perfect result.